From small gatherings to National conventions, Andy will inspire your delegates. "I cannot imagine telling you how you could improve....you are able to do things on the fly when necessary - always the consummate professional. It is not just what you do on the stage that impresses the participants (teachers and students alike) it is how you engage the students between formal sessions as well. You are always available, personable and approachable. 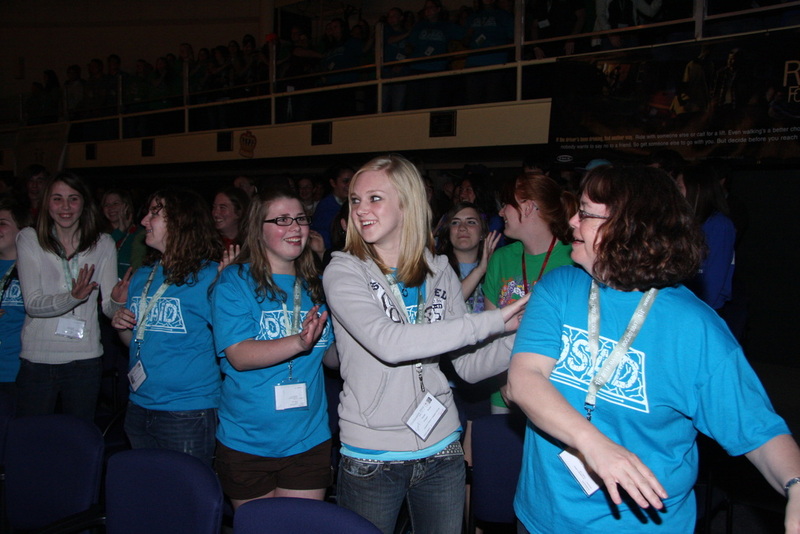 The students leave the conference wanting to "be you". I cannot think of a better role model." Additional presentations include his "Making Care Contagious" leadership workshop for students and their advisors. It is an excellent follow-up to his keynote as it empowers leaders & advisors with the "tools" to continue with his messages. Both Andy’s keynote and workshops feature icebreakers and cheers that will get your delegates standing up to laugh and participate. 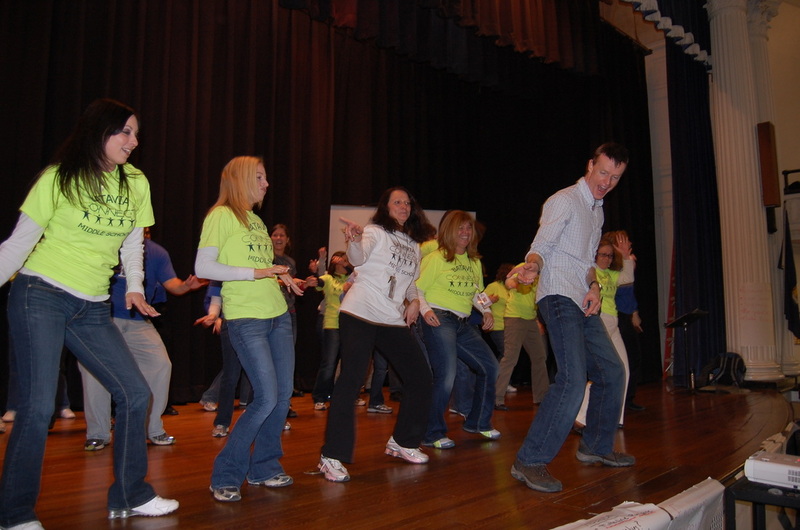 Every session with Andy has the feel and energy of a pep rally! Andy can also deliver 15 to 60 minute Spirit Sessions of icebreakers that will get your participants laughing, cheering and participating! Many conferences book Andy to provide the opening session of Icebreakers or to act as an MC during multi day events and lead icebreakers before each general session. WHAT ORGANIZATIONS HAVE USED ANDY’S IMPACT PRESENTATIONS? Andy has spoken at every Canadian provincial conference at least three times, the Canadian National conference 6 times, the USA National Conference twice, and 35 US state student council conventions. Youth organizations that have had Andy speak at their conferences include: Junior and Senior HS Student Council, US National Honor Society, Key Club (Youth Kiwanis), Rotary Youth, Future Business Leaders of America, 4H, SADD, Safe Schools Programs, Christian Youth Groups, Yearbook, Youth Athletics, Parks & Recreation Employees and College & University Leadership groups. Conference organizers love Andy’s 100% time commitment to their event. He arrives early to greet delegates, and spends time getting to know them, both students and teacher advisors, throughout the conference. He is available to help wherever needed – with ice-breakers, fun trivia contests, cheers, and as MC. 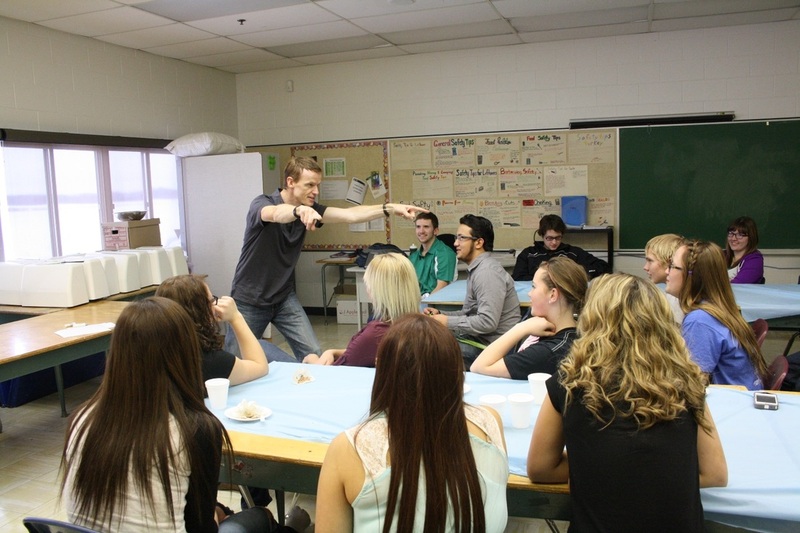 He offers powerful workshops for both the student and adult delegates. Negativity can kill the enthusiasm for leadership. In this hilarious and life-changing program, Andy gives youth leaders effective strategies for dealing with negativity while inspiring care. Andy reminds leaders that, "Care is contagious, but as a leader, it has to start with ME!" From his own school leadership experiences, he offers realistic, easy-to-implement insights that will motivate your team! Andy’s keynote presentation runs 45 to 120 minutes in length, based on your needs. Andy’s presentations always include a mix of cheers, icebreakers and group games. He will keep the delegates active while giving them leadership skills that will inspire them to improve school spirit and increase participation. How do you get your care, out there? Andy has the answers with the 5 habits to “Make Care Contagious”! This 30 to 90 minute workshop offers youth leaders helpful insights on effectively communicating their care for the school to the students and staff. The presentation draws heavily on Andy’s years of experience as a student leader and as a speaker traveling the continent. This session is the perfect follow-up to a keynote presentation for conferences. It gives student leaders the hands-on tools they can immediately use to build on Andy’s messages. 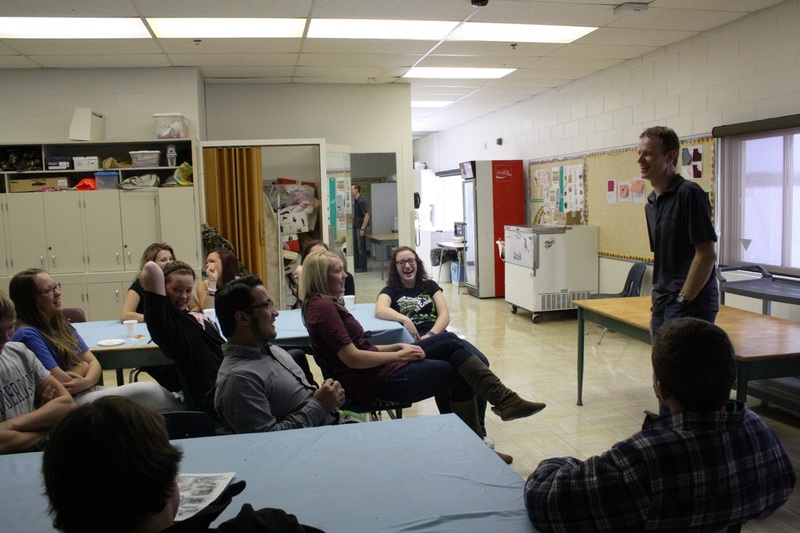 The “fun shop” is appropriate for leaders involved in any activities: from student councils and clubs to yearbook committees and peer support teams. Workshop sizes can range from 30 leaders to over 800! Andy also has a 2 to 6 hour version of this workshop. It includes discussion questions, skits, and active icebreaker participation. Email Andy and he can create a program to suit your needs! Many schools and organizations have booked this program to take up the entire day of their retreat or event. If Care is Contagious, it starts with ME! Leadership is a 100% time commitment! Take it to the streets, the parties, the malls, into the classroom, and out into the hallways. If you are there, show you CARE! “If it’s not going to be you, then who?” We must cheer; we must listen! We must show appreciation to those who participate in our events! AVOID, Stepping on Toes. Keep the concerns of the staff and administration in mind when planning events. TWO-WAY Communication. Stop relying on posters and announcements for promotion. Talking to people is the ultimate compliment you can give to your fellow students. Care FAIR. Show equal respect and appreciation to all of the teams, groups, and interests in your school. Learn to celebrate a wide range of championships – from sports and music to clubs, yearbook and academics. "I was lucky enough to have a chance to see your presentation "Share Your Care ". I'd like to say thank you. That presentation alone has a huge impact on my life. The things you said, your stories (in particular one about being President, going to see a school hockey game, and just setting an example for everyone there by congratulating the team despite a loss) and your all around personality have made a lasting impression. As a person I actually feel better about everything, whether it's the world, society or just the school community. You showed me that I can make a difference by simply daring to care. Your presentation truly inspired me, and for that I thank you." Execution of ideas is the number one challenge for young leaders organizing events. This session will immediately improve the ability of your team to work together and improve their organization skills. This session addresses the concepts of time management from a unique perspective. Trust is the foundation for loving families, fun friendships, spirited students' councils, successful businesses, and effective leaders. Yet people earn the trust of another by being reliable. Andy offers useful and immediately applicable advice for improving reliability. Through his insights, Andy demonstrates how increased reliability improves one's time management, creates successful events, and inspires TRUST in leaders! With all student leaders and teachers balancing their time between school, family and work commitments, this program can transform how your team organizes their priorities! Workshop format is completely flexible. Andy can perform a 30 to 60-minute version as part of a workshop rotation or do a 2 to 4-hour version which includes increased interaction, a question/answer sheet, and more icebreaker games. Get "excited" about your next speaking opportunity! This session draws on Andy's massive speaking experience, ranging from high school pep rallies, university orientation weeks to adult program across North America. He offers hands-on insight on: overcoming "the fear" (and how it is linked to self esteem), putting more "you" into all of your communication, using the "power of the positive", and how to "visualize" your improved speaking performances. Andy's ideas are applicable whether you're communicating with one person or one thousand. Do you need a 15 to 60 minute block of time filled with cheers, large group games, and icebreakers? Andy can easily provide a hilarious session that will get all of your conference participants on their feet to laugh, cheer and meet each other! Both “Making Care Contagious” and “Can I Count on You?” are available as adult advisor workshops. Each of these presentations empowers adult leaders to support their students when they return to school. In “Making Care Contagious”, Andy shares numerous activities and events that schools can run that support the 5 Habits. “Can I Count on You?” will give adult advisors the tools to keep their team organized. In addition, both of these programs are an empowering reminder to adult advisors about the difference they make inspiring youth leaders. Advisor Session: "Mix & Mingle"
Andy has a hilarious and empowering workshop for advisors that will get the adults at your conference interacting and laughing. Games, contests and cooperation activities make it an excellent first session to set a tone of fun and cooperation between the teachers. It can be a different program then the large group “Spirit Session” noted earlier and thus you can use both at the same conference. Even better is that the participants can take these icebreaker ideas back to their school for their own use!